I’ve been admitted. Now what? What will your first year cost? UBC supports inclusive learning, living, and working environments for students of all abilities. The Disability Resource Centre on the Okanagan campus and the Centre for Accessibility on the Vancouver campus work with the university to provide programming that removes barriers for students with disabilities. If you’re an academically qualified student with a disability, we encourage you to contact the Disability Resource Centre on UBC’s Okanagan campus or the Centre for Accessibility on UBC’s Vancouver campus, where you’ll have access to tools, resources, and accommodations to make your UBC experience the best it can be. Students on the Okanagan campus must request academic accommodations by filling out self-assessment forms and consulting with a diversity advisor. You will receive services specific to your disability, and if you’re a returning student, you will have the opportunity the review the previous year’s accommodations and build on them or change them where appropriate. Students on the Vancouver campus must register with the Centre for Accessibility to meet with a diversity advisor, who will determine which accommodations you are eligible for. Meet other students like yourself who are striving to make UBC a positive, inclusive environment by attending events or participating in programs and workshops. The Really? workshops on both campuses put the spotlight on combatting discrimination through mini-lectures and interactive learning activities. Become an empowered member of the UBC community by learning how to respond to discriminatory situations as an active bystander. Become an Equity Ambassador on the Vancouver campus and join students who want to develop their leadership skills to help spark positive social change. This diverse group of students delivers educational information, workshops, events, and materials that help raise awareness of equity, diversity, and discrimination among students, staff, and faculty on campus. The Disability Resource Centre on the Okanagan campus wants to help you connect with your peers through its orientation. 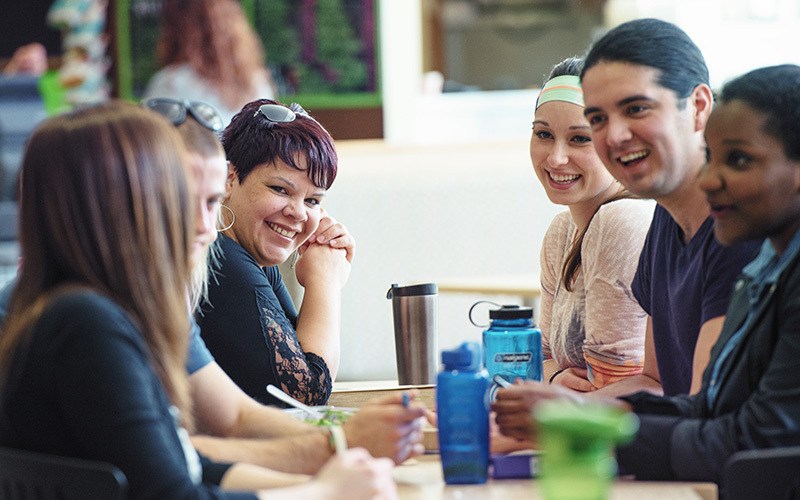 This information session will put you in touch with your community and Centre staff, provide you with details on accessing accommodations, and give you tips on how to navigate the Okanagan campus. Disability Awareness workshops on the Vancouver campus – including disability awareness training – are available on request or as scheduled classes. Visit the Centre for Accessibility blog for more details workshops like these, job opportunities, conferences, and other events happening around campus. If you’re taking public transportation to UBC’s Okanagan campus, there are many wheelchair-accessible city buses. You may be eligible for Kelowna’s HandyDart, a door-to-door shared-ride public transit service that accommodates passengers with physical or cognitive disabilities who are unable to use public transit without assistance. If you’re a registered HandyDart user or you’re unable to use public transit, you may be eligible for a U-Pass exemption. If you’re taking public transportation to UBC’s Vancouver campus, TransLink can assist you in planning a wheelchair-accessible route. You may be eligible for the HandyDart, a door-to-door shared-ride public transit service that accommodates passengers with physical or cognitive disabilities who are unable to use public transit without assistance. If you’re a registered HandyDart user or you’re unable to use public transit, you may be eligible for a U-Pass exemption. Both campuses offer disability parking if you have a SPARC decal, and UBC will provide reduced parkade rates for any student, staff, or faculty with a special needs permit (contact the Disability Resource Centre on the Okanagan campus and the Centre for Accessibility on the Vancouver campus for permit details). If getting around campus poses a challenge, you may be eligible for priority registration and/or classroom moves. Check out maps of the Okanagan campus and Vancouver campus to identify accessible entrances and plan convenient routes. If you have a disability or ongoing medical condition, you could be eligible for priority access to housing on UBC’s Okanagan or Vancouver campuses. UBC is pleased to provide academic support for students with disabilities on the Okanagan and Vancouver campuses, such as exam accommodations, captioning and sign language interpreting, note taking, and more. If you require help to demonstrate your knowledge of the course material in cases where a disability or ongoing medical condition may impact your ability to access exams under standard conditions, exam accommodations are available on both the Okanagan and Vancouver campuses. Take part in the Peer Tutoring Program on the Vancouver campus, and be matched with a trained peer tutor for one-to-one tutoring on a weekly basis. The Disability Resource Centre on the Okanagan campus will help set you up with a tutor or tutor referral if you have registered with their office. There is a wealth of financial assistance programming available to you on the Okanagan and Vancouver campuses, as well as awards for students with disabilities. The National Education Association of Disabled Students also provides resources and scholarship opportunities for Canadian students with disabilities. UBC provides academically qualified students who have a disability with a variety of services through the Centre for Accessibility. Take a virtual tour of UBC's Okanagan and Vancouver campuses from anywhere in the world. Ready to be a UBC student?